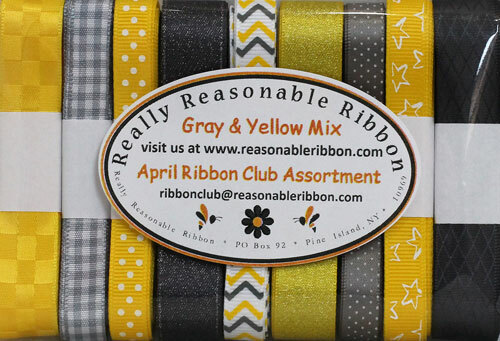 If you really love ribbon and would like to have a wonderful assortment of ribbons sent to you automatically each month, just join the Really Reasonable Ribbon Club! Monthly ribbon club assortments are selected and pre-packed to reflect a specific theme, color, or holiday season. The assortments vary from month to month, but an average assortment has 9 different ribbon styles and consists of 16-18 yards of ribbon. The total price of each monthly assortment is $21.50, or the price of each bi-monthly shipment (see below for details) is $29.50 and this includes the shipping/handling fee too! Payment for the club is by credit card through our secure, on-line shopping cart system. You need to go through check-out only once; your information is then kept on file for the extent of your involvement in the club and there is no further action needed on your part until the point at which you choose to leave the club. You may join or leave the ribbon club at any point for any reason...no questions asked...and your satisfaction is always guaranteed. All you need to do to stop is e-mail us with a TWO WEEK notice, and we'll discontinue your membership. When you join you agree to allow Really Reasonable Ribbon to charge your account the monthly fee once per month or the bi-monthly fee on the months indicated below at the time your assortment is sent, and we will "keep 'em coming" until you tell us otherwise (see just above). We must ask for some flexibility on timing, but we strive to ship assortments between the 1st and the 10th of each month. Unfortunately we can't guarantee the exact day since we give top priority to incoming customer ribbon orders and we process the ribbon club assortments as time permits. NOTE: You are not enrolling in the club for any SPECIFIC time period and there is NO OBLIGATION to stay for any specific length, but we would appreciate it if you would stay for at least three months. When you're ready to leave the club, just e-mail us with at least a two-week notice, and we'll stop sending your club assortments. Thanks! Your monthly subscription will begin with the April 2019 assortment. Due to the latest shipping fee increase we are now offering bi-monthly subscriptions to ease the cost of shipping. You can now select bi-monthly shipping for your subscription. If you select this option, the assortments will ship in mid January, March, May, July, September and November. The shipment will include that month's assortment and the month before or after as stated below. When you subscribe in April, your first bi-monthly shipment will contain the March and April assortments. *PLEASE NOTE* This item is not eligible for any sales or other promotional offers.